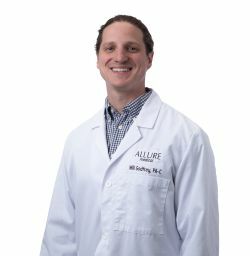 Will Godfrey is a Board Certified Physician Assistant and holds his Bachelor in Exercise Science and his Masters in Medical Sciences. He is a Greenville native, attending USC Columbia for his undergrad and Mercer University in Atlanta, Georgia for his Masters. After school he returned to the Greenville area and spent the following 2 years in Emergency Medicine. Will's spare time is spent living in and fixing an old house, practicing yoga and spending time with his wife and dog.